"Put a spin on a traditional fall side with this colorful dish from Teri Lyn Fisher and Jenny Park of Spoon Fork Bacon." Preheat oven to 350 degrees F. Line a baking sheet with two long sheets of Reynolds Wrap(R) Aluminum Foil, overlapping them in opposing directions so you make a cross, with plenty of foil at each end to eventually fold over into the center. Lightly spray with cooking spray and set aside. In a large mixing bowl, stir together cream, shallot and garlic. Add parsnips, sweet potato and turnip and carefully toss together until all the pieces are well coated. In another mixing bowl combine 1 cup of the grated cheese, green onion, and thyme and toss together. Take your gratin from good to great! 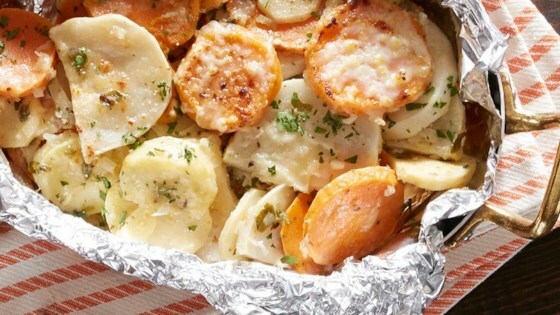 Wrap your dish in Reynolds Wrap® Aluminum Foil to seal in flavor.